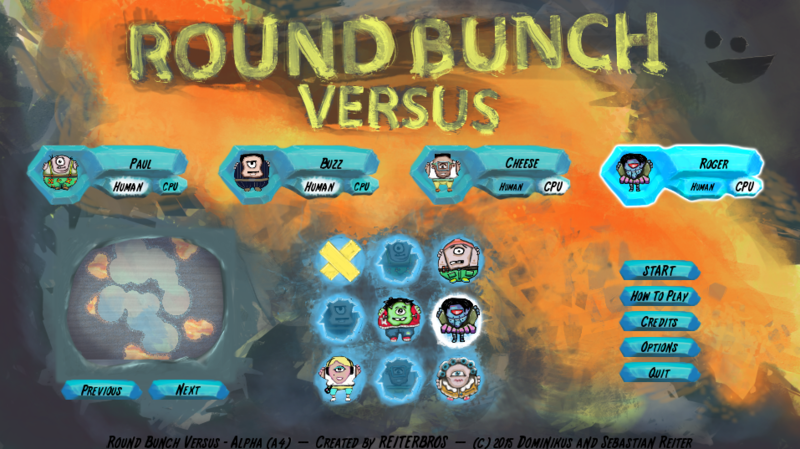 'Round Bunch Versus' is a local 2d hot-seat multiplayer game, which is clearly influenced by games like Worms, Artillery, or Scorched Earth. However, thanks to its softbody based physics engine, dynamic particle fluids, and a gravity-shifting world-rotate, it has some unique mechanics which clearly set it apart from those influences --- at least I hope so! The most recent update contains new weapons, difficulty settings, on-screen text, and many small tweaks and adjustments. Please download the game for free from our homepage (no ads/drm/etc): www.roundbunch.com. 2 to 4 players (human or CPU-players) fight against each other in an underground lava cave. Each player controls a team of 4 contenders. In each round one of the players rolls and jumps with one of his characters and to pick up new weapons or upgrades and - finally - throws a grenade or shoots stuff at his enemies. Explosions destroy the environment. If a lava-reservoir is hit, a flood of hot magma flows through the levels, roasting anything it touches. At the beginning of each round the world (and gravity) rotates so that the active character stands on horizontal ground. Since the different characters may cling to walls or ceilings, this gives a nice twist for different tactics. The download is a .zip archive which contains the Windows version of the game. Just extract it (RClick->ExtractAll) and run the game by executing 'round_bunch_versus.exe'. Tried it. Overall it looks great. There could be difficulty setting to make AI-s dumber, I think it's too hard for some people. The AI-s could trigger mines too. Not sure what's the logic for rotating gravity direction, it seems kind of random atm. Most of all it could use more weapons and more varied gameplay. The graphics style and softness are great. Keep it up! As it's mostly about lava I'm thinking of lava with different levels of hotness dealing different damage. Also something that would protect a character from potential lava flood for next turn(s). Maybe also powerups that boost the jumping height so it's easier to move around. The initial positioning of characters can give a very big advantage to one player as the ability to reposition is limited. When shooting at maximum speed it's very hard to see the projectile as it moves so fast. Some kind of smoke trail would be awesome. Overall it looks great, make sure to add variety and replay value. thanks so much for your feedback and your encouraging words. I'm glad that you liked the visuals. Your suggestions are all valuable, thanks! Adding difficulty settings absolutely makes sense. Different lava- or more generally fluid-types could be fun, too! The gravity rotates so that the active player stands on flat ground when the round begins. This may seem random unless you know the reasoning behind it - that's right. Initially players were able to rotate the world them selves. This however was a little hard to grasp unless someone explained it. With auto-rotation the matches are more fluid and a little more tactical, too, if you know the mechanics. Will have to see if I can make the rotation mechanics more obvious. Good point! Powerups for movement could be cool, too. Probably it would also be fun if one had more movement-options from the start. Things like double-jump, Jetpack or stuff like this. Regarding smoke-particles - i think thats spot on. Would also be nice when a character hits ground etc. Thanks again for taking the time to download and test it and for providing valuable feedback! Cool game you have there, play's pretty solid! I was playing on my laptop where i only had the mousepad, maybe zooming in-out could be done using a key as well? Also sometime i got stuck trying to get over a corner, something like a hook (ala lemmings), jetpack or manual rotation would help and be a fun addition. thanks a lot for taking the time to test and comment! Good points about the zooming. I will definitively add keys for that. The KI is indeed quite accurate . I'll add more options in the next version. We had manual rotation at the beginning of each round in some earlier prototypes. We chose to leave it out since it complicated the game a little too much and lead to a quite different play-style. However, reconsidering your comment, it could indeed be fun if one could tilt the world a little during a round. Just like 10 degrees to the left and right or something like that. By allowing for tilting even after a shot was fired one could alter the lava-flow a little, too. The volcano idea is cool. Functionally similar to a mine but spewing lava (hope I've got you right). Sounds nice! I'm still thinking about more movement options. Thanks for your suggestions! Thanks again for testing and sharing your ideas! Really appreciated! The new version features new weapons and upgrades, different difficulty settings, on screen text, and many other small tweaks and fixes. It'd be great if you would check it out (again) and tell us what you think about it!